As part of my end of the year round-up, I am posting interviews with a few of authors of my favorite books of 2011. 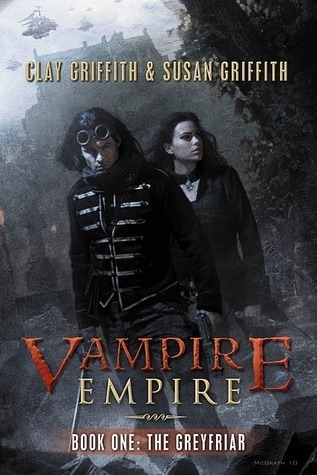 Today I'm featuring Clay and Susan Griffith, authors of the fabulous Vampire Empire series, thus far comprising of The Greyfriar and The Rift Walker. Clay and Susan have been married more than fifteen years. They have written many comic books over the years including The Tick, The Man-Eating Cow and, more recently, Allan Quatermain and the Lord of Locusts. They also script and contribute to the tv/web show Monster Creature Feature. Both The Greyfriar and The Rift Walker are wonderful, but I ultimately chose The Greyfriar to be amongst my Top Ten for the 2011. Each book stands out in a different way, but I particularly love the romance in the first book. Please welcome Clay and Susan to Alison Can Read! 1. How would you describe Greyfriar and Adele's personalities? The thing that separates them the most is that Greyfriar lives in the now. He reacts instinctively and immediately, no matter the situation. He lives by his actions, eager to react and protect what he feels is important. It’s not that he damns the consequences; he just doesn’t think about them at great length. It’s what makes him a poor politician, but a stalwart hero. Adele on the other hand is developing into a person who is always thinking about four or five moves ahead of everyone else. She’d make a terrific opponent at chess. She considers consequences because so many people are impacted by her actions. It is rare that she does anything on the spur of the moment. And if she does, she’ll pause to rethink the implications of her actions. She may hate politics but she is damn good at it. 2. One of the things that impressed me with The Rift Walker was that it avoided so many of the stereotypes of a "second book." Specifically - happy couple starts off together, some conflict separates happy couple, third wheel enters the picture threatening the renewal of happy couple's happiness, happy couple reunites and all is well leading into the third book. Was that something you consciously tried to avoid? We definitely wanted The Rift Walker to be an Empire Strikes Back-type sequel, meaning just as good if not better than the first book. We’ve been working hard to make this series something new and different from the start, whether it’s turning the vampire myth on its ear or mixing up the genres. The romance element to the story isn’t typical either. In fact, the romance between Adele and Greyfriar is pretty slow boil. In The Rift Walker they’re just becoming a “couple”, so there’s no real point in breaking them up with a third wheel. There’s too much to discover yet between the two of them. Also, our third wheel (Senator Clark) could never turn Adele from Greyfriar! In truth, the only third wheel they will have to contend with is the war itself, and the fundamental conflict of their natures. All other conflicts seem pale in comparison. 3. Vampires are so common now that they seem passe. The Vampire Empire vampires are definitely a different breed. Still, did you have trouble convincing publishers to look at a vampire series when werewolves and zombies seem to be the "hip" paranormal creatures? We’ve been working on this series for quite some time, and the vampire craze came and went at least twice since its conception. But the beauty of the vampire is that they are timeless. Frenzies may rise and fall (Anne Rice’s Vampire Chronicles, Buffy, Twilight, to name just a few most recent), but vampires will always rise again (no pun intended!) There will always be an interest, and publishers were still interested in vampires too. Actually, we saw publishers on both sides of the fence regarding vampire trends. Some said our books were not similar enough to other bestselling vampire series, while others said it was exactly like them, and they needed no more. But our series isn’t just a vampire story. It’s about relationships, politics, war, and high adventure, and we are thankful that Lou Anders, our editor at Pyr Books, saw a narrative than wasn’t just another rehash of an old monster. 4. If I worked with my husband, I would kill him - probably in less than a day. How do you balance your work lives and your personal lives? Sometimes working together as a married couple is hard. Other times it is a blessing. The initial creation and then the final editing are usually the most difficult segments of the collaboration. That is when we are fighting the hardest to keep something personal in the story. Arguments can get loud, though rarely dangerous, unless one of us grabs a frying pan or the cat. But the rest of the writing process is fairly solitary. We both have separate offices and we work at different coffee shops sometimes. Updates are given when we get together over dinner or on the weekends. Bottom line, collaboration is hard, but we both know the final work is better for it. We both trust and admire what the other brings to the table, so at the end of the day, when we kiss and make up, we realize that what we are creating is something folks will love as much as we do. 5. The Steampunk genre is fairly new to me. Can you recommend some other Steampunk books? Currently, we’re reading George Mann’s Newbury and Hobbs series. We love the flawed characters as well as the unique neo-Victorian world. The standard setters these days are Gail Carriger’s Soulless series and Cherie Priest’s Clockwork Century series. There’s also The Society of Steam novels by Andrew Mayer and Mark Hodder’s Burton and Swineburne series, as well as the young adult series by Philip Reeve called Mortal Engines. And although steampunk seems relatively new, there are classics in the genre, like The Anubis Gates by Tim Powers, which has a great cast of eccentric characters. 6. What advice would you give to an aspiring writer, aside from the obligatory "Read a lot and Write a lot"? Read a lot and write a lot. Yes, it is obligatory, but it’s still true. Okay, beyond that, we tell aspiring writers not to get discouraged, and learn to invite and interpret criticism. Aspiring writers will receive a great deal of criticism along the way from readers, editors, reviewers, even friends and family. Never hear the criticism as saying “you’re a bad writer.” Never let that criticism make you stop writing. Use it instead to learn and hone your craft to the next level. Negative comments can come for a variety of reasons. Genuine issues can be anything from confusing grammar to a lack of focus on themes to a change in character that seems unlikely, or your reader might be having a bad day or your story could be outside their comfort zone. The trick is to discover if the criticism is something you can control and correct, or whether it is something beyond your control. Never turn a blind eye to criticism out of arrogance or anger, but embrace it and explore the reasons behind it in order to discover if it is something important that can make you a better writer. Fantastic interview, this is one of my favorite series! I would most likely want throttle my husband as well if we worked together, but at the same time he thinks so differently from me that it might be nice to have his insight on some things:) I agree that vampires will always be timeless and will continue to rise and fall in popularity, but they'll always be there, and I'll always be right there waiting for the next story to feature them! Oh now I really have to get this series! I agree that vampires' popularity has come and gone but I think there is still interest in them especially if there is a new added twist to them. I'm relatively new to steampunk but I've enjoyed what I've read and can't wait to read more. Wonderful interview, Alison! Great interview! Thanks so much for posting. Wendy Darling (Jamie from GR waves)- you must read this series. One of my faves of 2011 (I read them both this year). This series is about so much more than vampires and romance. It's about politics, loyalty, betrayal, duty, and so much more. I can't wait until Book 3 is released. This series totally rocks! Great interview! I love this series! Great interview, Alison. The Griffiths are a cool couple and their vampires are the best vampires I've come across. The characters are really amazing, as well. I've been hearing a lot about these books, and they keep sounding better and better. Can't say I've read steampunk vampires before, but I can definitely seen the potential for really unique world building with crossing these two genres. Consider these added to my TBR pile! A good kiddie bean container office chair are provided sin most of hermes replica together with designs professionals who log in quite possibly “dress” any kiddie bean container office chair for example the most loved cartoon character, so that it will get the interest without delay. Any long-lasting together with water-resistant contains that can be purchased also come in very useful as soon as the boy or girl is certainly getting this electrician hermes replica when using the nutrition or simply watercolors. In fact, you can expect to together enjoy! Every last fighting man or simply boxer is wanting to know different competencies together with stunts on what that will lose affordable a good device or simply some sort of assailant. Experiencing the way to perform together with know those relatively prada replica to educate yourself competencies may be a annoyance. Plenty of people style their selves to build it all a good custom overly, to generate your muscles groups as they definitely perform workout. Plenty of people opt for putting away an exceptional room in your home meant for work outs or simply a open composite within the coziness within their gucci replica belts. The should not be likely except when one can find applications to apply together with support curbing any passion. Purchasing punching container Kevin might be a terrific step for that major workout workman or simply just a good sporting events fella planning to cause it to be thru fighting or simply boxing. Gymnasiums together with gucci replica arts classes overly will think of choosing punching bobs thus to their trainees meant for valuable strategies. Enter into the esophagus a good our for example container meant for studying fighting, boxing together with other matches.